Starbucks to Offer Value Menu. Fries, er I Mean, Scone with that? Do you want a bagel with that? How about a 500 calorie slice of iced lemon bread? 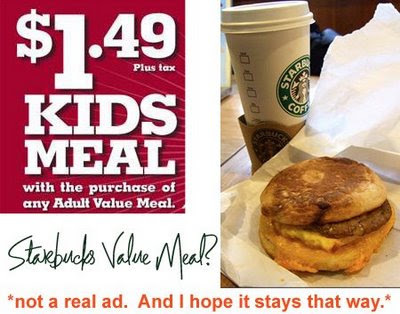 Starbucks plans to add value meals to their menu. "At attractive prices." -Howard Schultz, Starbucks CEO. Can we have a big "errrgh!" buzzer sound here. The 'that is not the way out of your financial mess buzzer'. Lets get honest here. There is nothing value-worthy of a $5 latte. But that's not the point. Starbucks customers are not seeking a cheap coffee. They are seeking a sophisticated experience. An escape from their hectic, stressful and unpredictable day. Starbucks is not a "must have" food. It is a personal luxury. A treat. Like say, Pinkberry. The smartest move Starbucks has mad in the past few quarters is the Starbucks Gold card. It allows Starbucks regulars to get a significant discount of their purchases, 10%. And in the long run, the savings really add up. Perhaps Starbucks should increase this percentage to 15% from time to time and reward its 'regulars'. instead of catering to the 'value menu crowd'. I frequently purchase a chai latte and a bagel on the side. If this was say "the number three" on the value menu and I saved fifteen cents of so...I would feel kinda cheap! If I want to order off a value meal (which I really don't) I would go to McDonald's. .....Lets face it. There is nothing value-worthy of a $5 latte. But that's not the point. Starbucks customers are not seeking a cheap coffee. They are seeking a sophisticated experience. An escape from their hectic, stressful and unpredictable day. Starbucks is not a "must have" food. It is a personal luxury. A treat. Like Pinkberry or another fro-yo place. You don't see Pinkberry coming out with a "value meal". Buy two smalls with two toppings for %7.22! "It's number two on our value menu!" Value menu at Starbucks? Not a fan. Bigger discounts for regulars? Fan.